In the cafe Imran confronts Wayne, who’s prevaricating over his report, about the news Carla has done a runner. When Wayne heads out, he inadvertently leaves his report on the table. Imran reaches for the report but Wayne returns and catches him red handed. Nick steps in the diffuse the situation but Wayne later discovers his car has been broken into and his report stolen. Convinced Imran is behind it, Wayne bars his way and accuses him. Imran is shocked and protests his innocence as the police arrive and haul him in for questioning. Peter is exhausted after a sleepless night and a fruitless search for Carla. When he calls in The Rovers with the news that Carla is missing, she’s mentally ill and believes Rana is still alive, Johnny and Michelle are taken aback while Kate’s scathing. Later, Johnny, Michelle, and an apologetic Kate turn up at No.1 and assure Peter that they’ll help him track down Carla as they’re as worried as he is. Sally calls in the cab office and is appalled to find Dev and Steve messing about with a blood pressure monitor whilst Tim pretends to have another heart attack. An upset Sally implores Tim to start taking his condition seriously as she doesn’t want him to die. Bethany’s bemused to clock Gary driving his builders van dressed in a shirt and tie. After a wasted day trying to flog loans, Gary reports back to Rick who suggests he might be better suited to debt collection. Imran maintains his innocence as the police question him over the stolen H&S report. When questioned about Nick’s involvement, Imran becomes suspicious and wonders if Nick is implicated in Wayne’s report. Kate is overcome with emotion when a police officer hands her a bag containing Rana’s personal effects. In the cab office, Dev and Steve conduct a blood pressure competition with Tim adjudicating. Having changed back into his builder’s clothes, Gary returns home. Bethany’s intrigued and tells Sarah that earlier she saw him wearing a shirt and tie. Sarah watches as Gary sets off for work in his builders’ gear after stashing his suit into a holdall. Rick introduces Gary to his side-kick Sharon and says she will show him the ropes on his first debt collection. Having followed Gary Sarah is shocked to see him now wearing a suit and getting into a van with a woman. As the first house Gary is horrified to recognise the client as Vicky. Sharon orders Gary to go through Vicky’s things and take anything of value. Having ransacked Vicky’s possessions, Sharon starts knocking her about. How will Gary react? Toyah reveals to Nick and Leanne that the police believe the factory roof was sabotaged deliberately for an insurance scam. Nick’s secretly horrified. 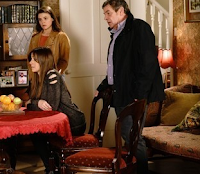 Michelle lashes out at Robert and suggests that if he hadn’t named and shamed Carla over the roof collapse, she wouldn’t have had a breakdown and gone on the run. Sarah is concerned when Gary has not arrived home and when she hears from Nick about the theory that the factory roof collapse was an act of sabotage she is worried that Gary might be implicated as he was doing the work. Gary calls to see Rick who tells him he still owes him £11k and he should do everything he is asked. Chesney is shocked when he returns from a visit to the shop to find that Gemma has taught Joseph to play poker and has fleeced him out of money! Gemma is upset as Chesney declares it the worst holiday ever. Worried that the police believe the factory roof collapse was sabotage Nick decides to tell the police about the £30k he put in the account, claiming it was from his own savings to pay off his ex wife. Having taken a phone call, Robert downs tools and hurries out of the bistro. Kevin calls at No.4 and handing Abi a name and address, tells her there’s a job going at a nearby garage and he’s put in a good word for her. Abi’s thrilled. Furious that Chesney doesn’t trust her to look after Joseph Gemma stomps off to the village and ends up in the local pub entertaining the regulars and getting bought drinks. Chesney rings her and they row when he realises she is drunk. Upset Gemma walks back to the campsite and lets herself into the empty caravan and falls asleep on the sofa. Sarah frets over Gary, convinced something terrible has happened to him. Sarah confides in Bethany that the police want to talk to Gary and she’s worried he’s in some way responsible for the factory roof collapse. Meanwhile Gary is stunned to find Rick lying in wait at the builders’ yard, he is forced to sign over his van and all the fixtures and fittings at the yard to cover his debt. Gary gives Cathy Alex’s passport and tells he has got involved with a loan shark and he needs to pay it all back ASAP. Beth tells Sinead that the family will be upset if she doesn’t have a traditional church christening for Bertie. Sinead tells Daniel that she doesn’t want to cause any problems so will have a christening. Seb suggests to Eileen that he should move into the front room so she can rent out his current room to Jan, a proper paying lodger. Eileen helps Jan move his things into No.11. Jan gives Seb a delivery bike he found in a skip and suggests they do it up so Seb can set himself up doing odd jobs. A despondent Abi tells Sally she failed to get a job because of her lack of GCSEs. Sally points out to Abi that it’s never too late to do her GCSEs and she could arrange some private lessons with Brian. When Beth spies Claudia walking Eccles and failing to clear up the dog’s poo, she takes a picture on her phone as evidence. Beth reports Claudia to the dog fouling hotline.